NCAA outdoor runner-up, Two-time first-team All-American, SEC outdoor champion … Posted a top-two finish in every regular season indoor meet during her second indoor campaign for the Razorbacks … Vaulted a season-best and NCAA lead of 15-1 at the Arkansas Qualifier, which earned her national and conference athlete of the week honors … Scored eight points for the Razorbacks after posting her second-consecutive 15-foot clearance at the SEC Indoor Championships to finish in second place … Qualified for the NCAA Indoor Championships … Helped Arkansas place in the top-five with a seventh-place finish … Battled the elements throughout the outdoor season and was rewarded with five meet titles … Vaulted 14-4 or higher seven times during the sophomore outdoor season … Cleared a season-best of 14-11 at the Arkansas Twilight … Picked up her third SEC title, scoring 10 points towards Arkansas’ Triple Crown victory …. Qualified for NCAA Outdoor Championships … Completed her second year as a Razorback earning a silver medal at the national meet, propelling Arkansas to another top-five finish. 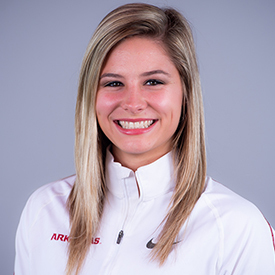 2016 Olympian, US Olympic Trials Bronze Medalist, Two-time NCAA Champion, Two-time First Team All-American … Vaulted a new PR and NCAA-leading mark of 4.50m/14-9 in her Razorback debut at the Arkansas Invitational … Became the fifth woman in NCAA history to vault over 15 feet at the Tyson Invitational with a new personal best clearance of 4.60m/15-1 — the youngest to accomplish the feat … Earned a gold medal at her first SEC Indoor Championship with a 4.48m/14-8.25 clearance … Selected as the SEC Freshman Field Athlete of the Year … Recognized as the NCAA South Central Field Athlete of the Year … Qualified for the NCAA Indoor Championships … Placed first at indoor nationals in the pole vault with an NCAA meet-record clearance of 4.63m/15-2.25 to become the first freshman in NCAA history to win a title in the event … Capped her first season with three clearances over 15 feet and undefeated in collegiate competition … Opened outdoor season with 4.50m/14-9 clearance at the Arkansas Invitational which earned her SEC Field Athlete of the Week honors … Set a new outdoor PR at the John McDonnell Invitational, clearing her first 15 foot bar of the outdoor season with 4.64m/15-2.75 … Posted another 15-foot clearance at the SEC Outdoor Championship to help the Razorbacks to their second-consecutive conference Triple Crown … Qualified for the NCAA Outdoor Championship … Vaulted to another NCAA title with a 4.50m/14-9 clearance at Hayward Field to cap her collegiate competition season … Qualified for the 2016 US Olympic Trials … Advanced out of the preliminary round by vaulting 4.40m/14-5.25 … Became one of the youngest qualifiers for the US Olympic team by setting a new PR of 4.70m/15-5 to earn a bronze medal … Completed her historic season, placing 19th in the pole vault for USA at the 2016 Summer Olympic games in Rio de Janeiro, Brazil. Set a national record in the pole vault at the height of 14’7.5” (2015) … Finished her senior season as the top pole vaulter in the nation on the outdoor circuit (2015) … Won the 100-meter hurdles and long jump at the AR 7A State Meet (2015) … Placed atop the Army National Guard Cyclone Relays in the pole vault, long jump, and 400-meter sprints (2015) … Was the second-best long jumper and 100-meter hurdler in the state of Arkansas (2015) … Won the Arkansas Gatorade Player of the Year for Track & Field (2015). Born on Nov. 20, 1996 … Daughter of Brent and Amy Weeks … Has three brothers; Tyler, Matthew, and Connor and one sister; Tori, who also vaults for Arkansas… Majoring in chemistry.